Many cruising sailors use the Internet in some shape or form. For occasional use, particularly with a Tablet, Internet caf�s or libraries provide all that is needed. Marinas are increasingly installing WiFi access varying in cost from being free to several Euros an hour. Fata networks (3g and 4G) are becoming widely available and costs can be reasonably priced for general use. Coverage is often good extending even to a few miles out to sea. Around much of Atlantic Spain and Western France we rarely had any black spots. Our problems came when we moved into France from Spain and before we were able to find a Vodafone or Orange shop. I am told that there are areas, particularly around western Scotland where data networks are simply not available but there is cell phone access. To the phone companies, the Internet used to mean, primarily, WAP (Wireless Access Protocol) which gets the Internet displayed on a mobile phone. Through systems such as Blackberry and Smartphones, Internet pages can be displayed and emails sent or received. This is fine for some purposes; increasing screen sizes have made their use feasible even for those with poor eyesight. Their main advantage over a laptop is that they are more robust. Except in fairly calm conditions, the laptop has to be packed away in a dry, padded place when at sea. For some purposes using a laptop can still be more convenient, even vital to some cruising sailors. The greater flexibility of a laptop for file handling and the built in keyboard are important to some. Soft keyboards on Tablets and the mini-keyboards on some other devices are not user friendly to all. Accessing the web used to mean GSM "data call" like a dial up connection on a landline. This piggy backs the data onto an ordinary mobile voice call, and results in maximum speeds of 9.6 kb/sec . You paid voice call rates all the time the connection was "open", regardless of whether you were doing anything or not. Then came GPRS (General Packet Radio System) which breaks the data up into "packets" and squeezes them in between other peoples voice calls. This results in a much faster speed (115kb/sec and faster with some phones with in-built software such as �EDGE�). GPRS has the benefit that you only pay for the volume of data sent and received. It is widely used for WAP and for sending Photos. It has a lower priority than voice calls, and occasionally may get "squeezed out"
The spread of 3G has meant, effectively, that GPRS is now almost universal around European waters. GPRS can be regarded as "2.5G"and, if your phone is GPRS compatible, it will receive data over 3G. Intentions to extend GPRS have been superseded by 3G. An easy and quickest way (in theory) of getting up and running is to buy one of the "data cards" that the phone companies sell. These simply plug into a PCMIA slot in your laptop, and away you go. However, there have been complaints about the reliability of these things, and they do not help you keep charges down if you go abroad. A more reliable alternative is the dongle that plugs into a USB port. I have never seen the advantages of either. If you use a mobile phone as a modem to your laptop, you have pretty well all you need, why pay more? A further disadvantage with data cards and dongles is that they are at laptop level, usually on the chart table and reception may be poor. Bluetooth with a mobile phone can improve reception. All you have to do is get them to talk to one another. Connecting the phone to the PC. Getting the right settings on the phone. One way of doing this is by Cable, which needs a phone with a cable socket to a serial port or USB lead. I found that serial port connections were subject to problems with dirty or worn contacts. Newer phones with USB connections are more robust. Infrared (or IrDA) allows the PC and phone to talk to communicate if they are placed within sight of each other. On a boat, this does not work reliably. A reliable connection is via Bluetooth; this uses a short range wireless technology, originally intended for cordless headsets. Not all laptops come with Bluetooth and so you may need to buy a "dongle" (about �12 from Maplins) which plugs into the PCs USB port. Windows 7, Vista and XP a include Bluetooth software so that the CD supplied is usually superfluous. Whichever technology you choose, you will end up with the phone looking like a "modem" to the laptop, as though you plugged it into a telephone land line. A useful feature of Bluetooth is the radio connection which enables the phone to be put higher up, perhaps on the cabin roof or, even, in a bucket a few metres up if the mobile phone signal at chart table height is really poor! When this page was first written this was a rather complex process. Nowadays there are free software packages that can be downloaded from the telephone company website. For my rather ancient Nokia 6300, I downloaded the Nokia "PC Suite". If this does not set up the phone then speak to the phone company's "data" helpline. This might require a text message that sets up the phone. With modern phones, the menus on the phone should be self explanatory. On my Nokia 6300, I went to Settings, Connectivity and selected Bluetooth. That was all that I had to do. Speaking to the phone company (eg Orange or Vodafone) make it quite clear that you want to use the phone as a modem. It is unlikely that the standard help desk will be able to help. On the first occasion, you will be asked for a 4 digit password. Type in 0000 (or whatever you wish) and hit Enter. Your phone will bleep and ask "Pair with (your computer name)". Hit OK on the phone which will ask for the password. Enter your chosen password and hit the OK button. You are now connected and can dial either your GPRS or GSM number. 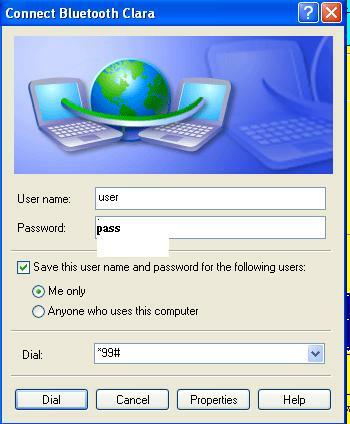 Thereafter, using the PC Suite, the phone and laptop will connect automatically. If not using the PC Suits, it may be necessary to right click on the Bluetooth icon and select Quick Connect, Dial-up Networking and the name of your phone. After the first occasion a password should not be required. But, if asked for a password, simply repeat the performance. Of the two types of Email, POP/SMTP mail is the more cost effective as it uses servers to download emails to your PC for "offline" viewing and composition. Web based email services, such as Hotmail or Yahoo. only need an Internet browser, and so are almost always guaranteed to work in any Internet cafe. However, the surrounding graphics add considerably to the cost of downloading emails. They are a definite NO on a mobile phone. POP/SMTP using Outlook, Outlook Express, Mozilla Thunderbird etc are much more suitable for mobile use. As Outlook Express (OE) is the most used, the following refers to it and it alone. To get Outlook Express to work correctly with GPRS you will need to make a couple of changes to its setup from that used at home. You can use your normal home ISP's incoming mail server BUT you cannot use your home ISP's outgoing server. To set up a new outgoing mail (SMTP) server - go to Tools, Accounts, Mail, Properties, Servers. Leave the My incoming Mail as it is. normally. In the Outgoing mail SMTP put that of your phone provider. You will have to ask the phone company for this address, it is not widely published. (Vodafone's is send.vodafone.net, with Orange it is smtp orange.net). One of the beauties of GPRS is that you do not need a UK ISP; the phone company provides the Internet connection. NOTE For those using MailASail, there is no need to change the SMTP. With computers, anything! A big problem is that when the system does not work, it often comes up with this panel. If you click "More Info" all you get is an obscure error messages which might as well be written in Swahili. With care and a modicum of luck, particularly with modern phones, it will work at the first go. Otherwise, perseverance, and help from the phone company, will always get you working. Experiences with company help lines varies but I (FS) have always found Orange staff to be well informed and understanding of an old buffer and his problems. The mobile phone charging system is a jungle through which the EU is now trying to hack a path. In particular, roaming charges have been a rip off but the rules are currently changing and roaming call costs are being reduced. GPRS data charges in 2013 varied greatly if roaming; Orange, PAYG, charged �7 for 10 mb or �5 for 10 mb per month (inc VAT). Obviously far more expencive than using a 3G data network but affordable ith care! Some PAYG accounts do not allow data calls. This forces the user to a contract and which one will depend on your overall usage. Those wonderful and much hyped N minutes of free calls are useless when away from your home country. Again, this situation is easing and PAYG is becoming more feasible for data calls. The expanding availability of WiFi hotspots, the introduction of 3G services with dongles to give direct and continuous broadband access are changing the landscape. Costs are coming down and the user must be alert and keep asking around. One problem is that some staff at the companies and, even more so, those in mobile phone shops are rarely up to speed. Contrary to popular myth, and despite the dire warnings the PC tends to flag up, both the mobile phone, and WiFi (even "unsecured" and "hijacked" WiFi) are secure. It is probably more secure than using an Internet caf�. As for high security links like Banking, the connection between your PC and the Bank is encrypted, and using your PC ensures you do not leave a "history" around on someone else's PC to be interrogated. All your "favorites" work too. It is only prudent, however, particularly if using WiFi, to run up-to-date Virus checkers and a firewall, as you do not know where these networks have been, and infection is a definite possibility. Even working at home, it is always wise to "clear history" after any financial or other sensitive transaction. It is also wise to have any sensitive files encrypted. Un-encrypt when required but remember to delete the un-encrypted version after use and then deletee from the "Revycle bin." For many sailors, the idea of using a cell phone for Internet connection might seem archaic in view of 3G or 4G data networks and Marina WiFi. However, cell phone connection has its uses in some areas and is well worth having available to you with occasional checks that it all still works. These notes are based on an article in the Winter, 2005 Hallberg Rassy Owners Association magazine written by Ivan Andrews to whom I am indebted for the use of his text which I have amended in the light of my own experience. Links to other pages on this site dealing with communications are to be found on my Home page.